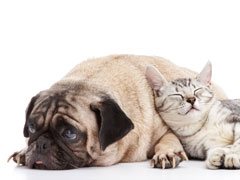 If you know of any cat with a severe problem characterized by sporadic or continual facial pawing, licking and crying out; please have their owners contact Dr. Dale Kressin and Dr. Honzelka. These poor kitties need help as soon as possible. Tongue mutilation has also occurred. A systematic method will be used to identify any underlying cause of this behavior. Feline Orofacial Pain Syndrome is most often seen in Burmese and Siamese shorthair cats. Orofacial pain disorders are well described in humans and Feline Orofacial Pain Syndrome shows some similarities to trigeminal neuralgia. Trigeminal neuralgia is characterized by paroxysmal bouts of pain in the distribution of the trigeminal nerve, usually the jaw.